The borderline retarded Governor William J. Le Petomane is seen here with his very qualified secretary. 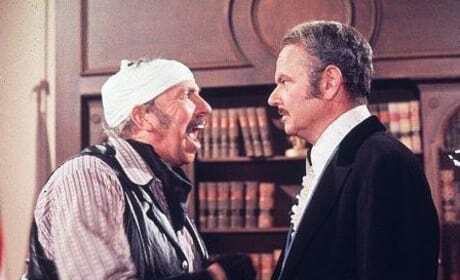 Hedley Lamarr is busy listening to yet another failed attempt by his goofy henchman, Taggart in Mel Brooks' Blazing Saddles. 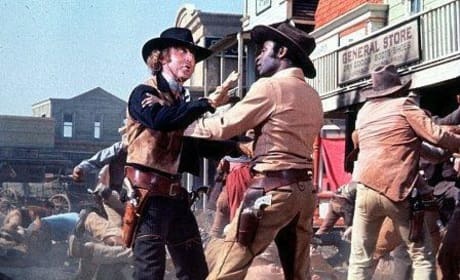 Jim, aka The Waco Kid, is trying to settle down Sheriff Bart in this scene from Mel Brooks' Blazing Saddles. 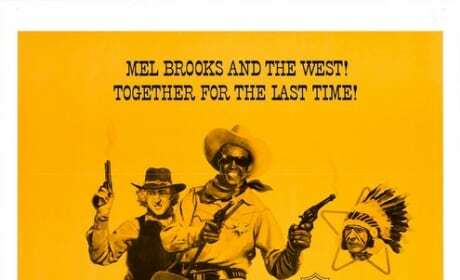 The poster from Mel Brooks' Western spoof, Blazing Saddles. Never give a saga an even break! Taggart: Break's over, boys. Don't just lay there gettin' a suntan, ain't gonna do you no good anyhow. Now take this shovel and put it to some good use. Charlie: Don't do it, Bart. Bart: Uh-uh, baby, I have to. Lyle: Send wire, main office, tell them I said ow, gotcha.